AuBurn Caps To Cash gives organizations an easier way to earn cash! Who can participate? Churches, Youth and Sports Groups, Non-for profit organizations and service groups (see Official Rules for eligibility requirements). Are you a school or PTO? Check out the AuBurn Caps To Cash KIDS program to see how you can participate and start earning cash! an easier way to earn cash. COMING SOON! The AuBurn Healthy Kids Free Monthly Vitamin Program was developed for all children age 5-12 in hopes of helping the children in the communities we serve lead healthier lives by providing them access to high quality daily multi-vitamins at absolutely NO CHARGE! We felt it was also important to develop educational materials to teach the children the importance of taking their daily vitamins by helping them understand what these vitamins do for their bodies. The Healthy Heros materials introduce The AuBurn Healthy Heroes characters in either the coloring book, maze, word search and crossword activity pages and helping children understand how each of them explain the different vitamins in a multi-vitamin. We go one step further by teaching students what foods they can eat to get these vitamins as well. It is our hope that by the end of their time with our Healthy Heroes the children will realize that they too can be “Healthy Heroes” by taking their daily vitamins! Healthy Habits…Healthy Children!! AuBurn Pharmacy, INC. partners with local school districts to educate students during National Nutrition Month. The primary objective of AdvantaCare is to improve patient adherence through refill synchronization, communication and education. Patient’s medication refills should be synchronized leading to less frequent communications with their doctor and fewer visits to the pharmacy. Through a scheduled refill pick-up meeting AuBurn will have the opportunity to offer MTM’s, vaccines, wellness visits, diabetic shoe fittings, and other clinical services. Every patient enrolled in AdvantaCare is automatically enrolled in AuBurn Advantage allowing them to receive all loyalty benefits including emails with pertinent healthcare information. The AuBurn Pharmacy AdvantaCare program is to improve patient adherence through refill synchronization, communication and education. AuBurn EZMed packaging system gives you the peace of mind that you are getting the right medication at the right time every day. This packaging was developed to help our patients organize and simplify your daily medications. With EZMed packaging, medications for each day are packaged into one bubble for easy dispensing. All you have to do is pop the medications out of the foil backing for the appropriate day and time. When reviewing the card the bubbles are packaged on, it is immediately visible if you have missed or doubled up on any doses! It takes any guessing out of the equation. The AuBurn EZMed packaging systems helps you manage your daily medications more efficiently by helping you easily identify when you only have 3-5 days left giving you time to order your refill or to get to the pharmacy to pick up your refill if you are enrolled in the auto refill program. The EZMed packaging system is part of the AuBurn AdvantaCare medication synchronization and adherence program. Diabetic Shoe fitting services are available by appointment at all 17 retail pharmacy locations and through our LTC providing pharmacies at any long term care facility. AuBurn Pharmacy offers a Diabetic Shoe Specialist who services AuBurn locations LTC facilities. Each retail location has an additional Pharmacy Technician who is also trained as a diabetic shoe fitter. The Specialist and other fitters perform diabetic shoe fittings, which is a measurement and assessment the patient’s feet to aide in proper selection of footwear. can participate in exercises you enjoy. Classes are conducted by AuBurn Pharmacists who are Board Certified as Advanced Diabetes managers and educators! is FREE, Enrollment is Easy! Find out how you can get your breastpump through insurance! 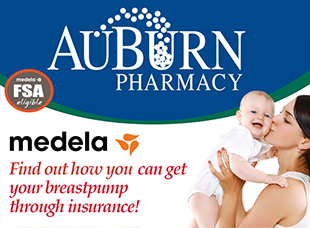 AuBurn Pharmacy is an: Authorized DME Provider & Biller, Authorized retailer of Medela breastpumps and accessories, FREE insurance benefit check to determine coverage, We accept FSA/HSA cards! Use your card to pay for eligible breastfeeding products, Consult with an AuBurn Pharmacist about the safety of your current medication while breastfeeding. Visit one of our locations for more information.